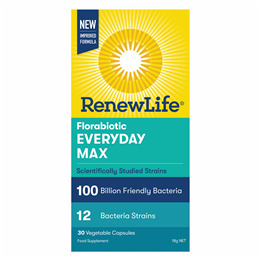 Ultimate Flora Ultra Potent is a 100 billion culture, 12 strain probiotic formula designed for those with severe digestive issues, completed multiple rounds of antibiotics or for those who want the most complete and effective probiotic on the market. It also offers therapeutic support for people suffering from infections, colds and flu and low immunity. Live bacteria consisting of the following: Bifidobacterium lactis (3 strains), Lactobacillus acidophilus, Bifidobacterium longum, Lactobacillus casei, Lactobacillus paracasei, Lactobacillus plantarum, Lactobacillus salivarius, Lactobacillus rhamnosus, Bifidobacterium Bifidum, Bifidobacterium infantis, L-leucine, Vegetabel capsule (vegetable fibre and water) and cellulose. Contains no nuts, peanuts, sesame seeds, mustard, wheat, celery, gluten, dairy, egg, soy, crustaceans, shellfish, fish, added salt, artificial colour or preservatives, binders or fillers. Renew Life does not use genetically modified ingredients. All ingredients are Non-GMO / GMO- Free. Take one capsule per day, away from food. If you are on antibiotics, take at least 2-3 hours before or after. Below are reviews of Renew Life Ultimate Flora Ultra Potent - 30 Capsules by bodykind customers. If you have tried this product we'd love to hear what you think so please leave a review. 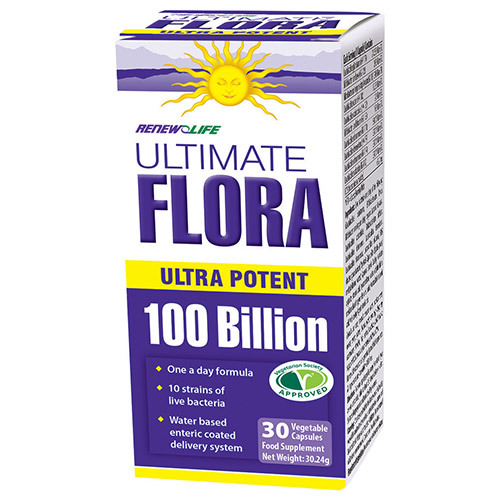 Ultimate Flora Ultra Potent is a 100 billion culture, 12 strain probiotic formula designed for those with severe digestive issues, completed multiple rounds of antibiotics or for those who want the most complete and effective probiotic on the market.